In India, for some reason we are all a lot more focused on Women's Day, Mother's Day and not as much on Father's Day, I don't even know if there is a 'Men's' day... But I decided that this Father's Day i.e. 18th June 2017 is around the corner and I want to gift something meaningful to my Father and my son's Father, i.e. my husband (on behalf of our kiddo ofcourse). Came across this gifting portal called Indian Gifts Portal which had some unique offerings and quite reasonable rates. I love quirky stuff, for myself as well as gifting and soon found myself browsing through their easy to navigate portal. They had a special curated Father's Day gifting suggestions so that is where I headed. Whether you are on a small budget say under 500 or whether you're looking for personalized options where you can add your own name, message etc, they have it all. You can even filter if you are looking for personalizable versions only or hampers only. I spotted a really cute hamper set of a spectacles holder, mug and coaster and decided that this is the best gift for my Father - as he wears spectacles and could totally use a spectacles holder and he also loves to drink his tea/coffee! This was priced at Rs.675 with free shipping which I thought was quite a decent deal. I did not buy the same set for my husband on behalf of our kid because he already has a spectacles holder and a 'World's Best Dad' mug, so then I found something he'd like in the general gifting 'For Him' section. 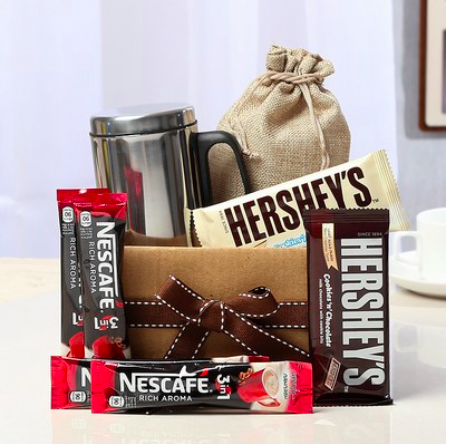 I purchased a steel mug with nescafe sachets and Hersheys chocolate. The steel mug comes with a lid and would be perfect for him to drink his coffee (along with the Nescafe ready-to-mix sachets) and he loves chocolates, specially Hersheys & Lindt. This was priced at Rs.710 with free shipping. I think it'll be really adorable when my toddler gives his dad the gift! I ordered both of these together but they were shipped separately, the former came to me within a couple of days while the latter took 2-3 days more. The packaging of the Hersheys with cup was very nice, hence I have not yet opened it as it's yet to be gifted. I don't know why the spectacles holder set wasn't in a nice gifting packaging. Do check them out next time you're looking for gifting options for your loved ones! I loved the personalizable perfume/after shave options as well. Do comment and tell me what you liked from their gifting portal, I'd love to know! Wish all you awesome dads out there a Happy Father's Day! 5. Indian Gifts Portal (IGP.com) has same-day delivery network in 300 cities in India. That's right. In India the focus truly is on mothers day and not fathers day. This is a really good initiative and I appreciate it.